Our guest post from Frances Aldson last week drew many and varied comments from our readers on this blog and elsewhere, including those at each end of a spectrum ranging from the enthusiastic to the choleric. This follow-up post is designed for those who have no strong views but who want to muse on the implications of the proposal which is due to be raised, via one route or another, with the UN, either this year or next. would this be caught by the definition of ecocide? should this be caught by the definition? In particular, is there a compelling purpose for making this act or omission an international crime? The examples will be familiar to many but it is important to explore the differences between them. The first example is, inevitably, the spill in the Gulf of Mexico from BP’s Macondo well. Given the forest of litigation about this, I take my account firmly from the superbly written Final Report of the National Oil Spill Commission addressed to President Obama. This involved the largest ever US oil spill, of 4.9 million barrels over a 3 month period between April and July 2010 (Compare the Exxon Valdez tanker and its 250,000 barrels, leading to the contamination of some 1,300 miles of Alaskan coast). Eleven people were killed and many injured by the methane explosion on the platform. The platform (containing 700,000 gallons of diesel) sank to the seabed, where it remains. The spill affected 320 miles of shoreline and impacted on the rich and complex ecosystem of the Gulf. The future duration and extent of that impact is unclear, principally because scientists do not know how a widely spread mix of oil and oil dispersants will affect that ecosystem in the long term. The Report blames BP, Transocean and Halliburton as having caused or contributed to the spill. BP was the operator of the oil concession; its fault, according to the Report, consisted of a host of errors in the design and execution of the testing and sealing of the Macondo well drilled to some 18,000 feet below sea level, coupled with lack of leadership and an inadequately thought-through response plan in the event of a spill. The spill plan was modelled on, for example, a worst case spill of 250,000 barrels as compared to the 4.9 million discharged in the Gulf disaster. Transocean owned the platform, Deepwater Horizon, and employed most of those who worked upon it; it was blamed for lack of communication with BP on critical issues. Halliburton were responsible for the cementing of the well which in the event failed, and there are complaints about the advance testing of the cement to be used for that purpose. The Report also had a devastating tilt at the hands-off and conflicted regulator, the Minerals Management Service, who were responsible for safety and environmental issues – and for maximising federal revenues from the letting of such concessions. Its light touch seems in part to have been a reflection of pressure from the industry and its supporters in government to the effect that industry could regulate itself competently – a theme in the current domestic political movement to Cut Red Tape, environmental measures being included in that definition. But that is another story. It appears that BP has set aside $41.3bn to cover its losses, including an estimated $3.5bn for fines for breaches of the Clean Water Act 1972, though some think that the episode may cost BP more than this sum by the time that all civil and criminal proceedings have been resolved against it. The second also involves BP, this time in Alaska in March 2006. A hole rather smaller than a 5p piece formed in an old (and ill-maintained) oil pipeline leading to the loss of over 5,000 barrels of oil and damage to 2 acres of tundra. There had been a number of warnings about the corroded state of the pipeline before the spill. In 2007 BP pleaded guilty to a Clean Water Act offence afor nd was ordered to pay $20m by way of criminal penalties. It has also, in May 2011, settled with the regulators for a civil fine of $25m for its lack of effective response to the spill and has agreed to carry out works likely to cost about $60m. Both the above are broadly speaking accidents – BP intended neither spill to happen, whether or not it was at fault or should have foreseen what occurred – similarly Transocean and Halliburton in the Macondo spill. 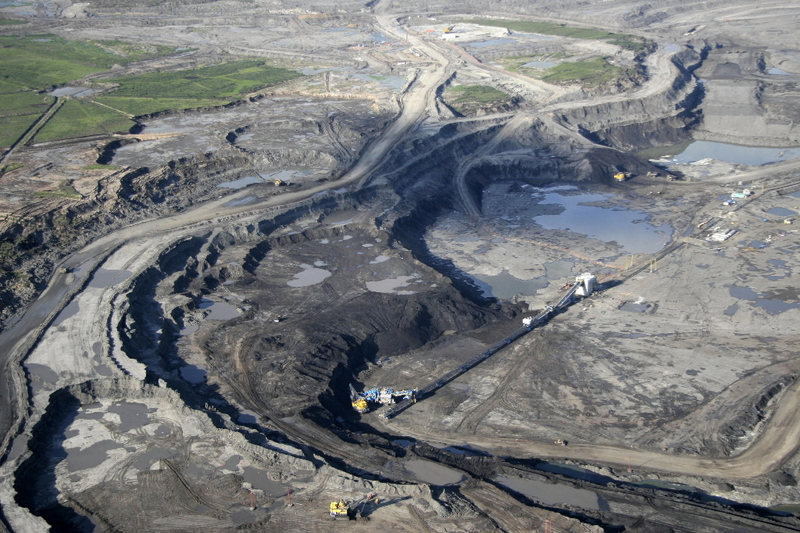 The third example concerns the Athabasca oil or tar sands, in Alberta, Canada. This is rather different. The sands contain a vast fossil fuel resource of bitumen, amounting to a significant proportion of the global liquid hydrocarbon reserves. However, unlike oil wells, the bitumen is extracted by a process akin to open cast mining: see picture above, and the NASA Earth Observatory image. The sands extend over some 54,000 square miles, approximately the size of England. Commercial extraction has been in progress since 1967, but a massive expansion is underway in response to declining oil reserves elsewhere and increasing oil prices. The Albertan government is highly supportive of the project – it stands to benefit hugely from it. The terrain is principally boreal forest and muskeg peat bogs, wherein lies one of the problems. Inevitably, the extraction process will lead to the loss of the current environment. This is a direct consequence of the process, not an accident, however effective mitigation, compensation or restoration measures may be. Alberta’s requirement is that the restoration of the land is to be to “equivalent land capability”, whatever that may mean. There has also been a well-publicised incident in which hundreds of migrating ducks died in a tailings pond containing the waste liquids from the extraction process. That said, the net long-term impact will vary depending how effectively and competently the process and the restoration is carried out. There are additional environmental impacts, on air and, to a degree which is controversial, on groundwater and water abstraction (the process uses a lot of river water to wash out the bitumen from the sands in which they are found).The current controversies are summarised on Mapleleaf, a Canadian environmental website. Finally, there is the impact of the combustion of the resulting bitumen oil on greenhouse gases: one estimate is that the net effect of the extraction and combustion process is to add some 15% to the total carbon dioxide load compared to that caused by extraction and use of crude oil. None of us will approve of the two BP spills. Whether we should criminalise them internationally is a different issue. The tar sands, and their various environmental facets, raise a further series of questions. Do we disapprove of their use and its consequences, and if so, should we criminalise them at the international level? That is a huge question, on which, in different ways, we will all be asked to say our piece before long. So get thinking. Is it time for a crime of ecocide? When Polly Higgins refers to ‘a given territory’, it is arguable that that ‘given territory’ could be said to include the entire planetary ecosystem. Arguably, accidents associated with organisations such as BP (including explosions at one of their US oil refineries, which also killed people) should be punished with heavy eco-fines and prosecutions for corporate manslaughter, where appropriate. However, the polluting effects of tar sands extraction should simply not be allowed. Full stop. Period. We all have a responsibility for the planet and for future generations inheriting a decent planet on which to live. Short-termist behaviour on our part is unacceptable.